Were you given a probation sentence as opposed to serving your sentence, or the remainder of your sentence, in prison or jail? If so, there are certain steps you must closely follow in order to maintain your freedom and avoid probation violation. Contact an attorney today for more information and for legal representation if you have been charged with a crime or with violating your terms of probation. Why Did The Court Choose Probation Over a Jail or Prison Sentence? The court may decide that putting an individual on probation is a more suitable punishment than sending that person to prison or jail. First time offenders, and those who have committed misdemeanors, are more likely to be put on probation than other offenders. It is generally much less expensive to put an offender on probation than to place them in incarceration. In some states, the cost of one year in prison amounts to over $60,000, while in Virginia the average inmate costs the state just over $27,000 per year, according to PolitiFact. As per Virginia statute 19.2-303, the court may use a GPS to keep track of the individual’s location. Additionally, the court may perform drug tests on the individual to monitor their adherence to prohibited substances laws. Possession a firearm or other illegal weapon. 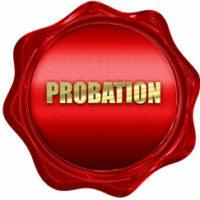 What Happens If I Violate My Probation Terms? A violation of probation could include your probation being revoked; a judge may order you to serve the rest of your probation period confined. Other penalties include having to pay additional fines, going to counseling, or participating in community service. If you committed an additional crime, you will face the penalties of that crime and any probation time that you had left may be added to the additional prison or jail time that was incurred by the charges of the new crime. The type of penalty you face is determinant on the type of violation you committed, the terms of your probation, the original crime with which you were charged, and the experience and competency of your criminal defense attorney. If you are being charged with violating your probation, it is in your best interest to seek experienced legal help at once. Call the Loudoun County, Leesburg, Winchester, Fairfax, and Prince William attorneys of Simms Showers, LLP today at 703-997-7821.